POWAY, CA--(Marketwire - August 4, 2008) - SpaceDev, Inc. (OTCBB: SPDV) would like to express its continued support and commitment to SpaceX and the Falcon 1 Launch Vehicle Program, despite its recent launch failure. The Falcon 1 Flight 3 vehicle carried the SpaceDev Trailblazer satellite, which SpaceDev had delivered under contract to the Department of Defense Operationally Responsive Space (ORS) office. In spite of the SpaceX launch vehicle anomaly, the program was deemed a very positive step in SpaceDev's history and a successful development in the rapid build and delivery of small satellites. The mission, called JumpStart, was provided for and funded by the ORS office of the Air Force Research Laboratory at Kirtland Air Force Base in New Mexico. It was the inaugural mission of the ORS office and was a multi-pronged effort to learn the process changes necessary to rapidly procure, build and integrate a responsive payload. SpaceDev delivered the spacecraft on-schedule and on-budget and met all the criteria set out by ORS. During the ORS down select, where SpaceDev's Trailblazer satellite was chosen for the flight, SpaceDev fully demonstrated its approach to modular responsive satellites. SpaceDev completed all contracted work by delivering the satellite to ORS and was fully paid for the delivery, so it incurs no financial risk as a result of the launch failure. "We wish to express our sincere appreciation to the ORS office for selecting and supporting our Trailblazer as ORS's first satellite, and to the Missile Defense Agency for its role in the development of the initial prototype program which lead to Trailblazer," said Mark N. Sirangelo, Chairman and Chief Executive Officer of SpaceDev. "With the delivery of the Trailblazer, SpaceDev has ushered in a new standard for low-cost satellites. The space business is one of great challenges, which are met by people taking great risks. 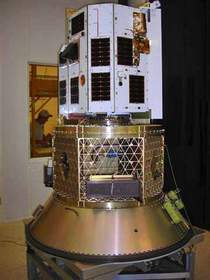 While the Falcon 1 Flight 3 launch was not a success, it does not diminish the hard work and efforts of the dedicated teams that, combined with the strong government support provided by the ORS office, enabled us to accomplish the unprecedented in-space history accomplishment of delivering a fully functional satellite within six months from ORS' authorization to proceed. Our satellite systems represent an excellent value and balance risk, cost, schedule and performance, so we look forward to a long and successful relationship with the ORS office, the Department of Defense, and SpaceX." Additional information regarding the launch can be found at www.spacex.com. SpaceDev, Inc. is a space technology/aerospace company that creates and sells affordable and innovative space products and mission solutions. For more information, visit www.spacedev.com. Except for factual statements made herein, this news release consists of forward-looking statements that involve risks, uncertainties and assumptions that are difficult to predict. Words such as "believe," "intends," "expects," "plans," "anticipates" and variations thereof, identify forward-looking statements, although their absence does not mean that a statement is not forward looking. Forward-looking statements are based on the Company's current expectations, and are not guarantees of performance. The Company's actual results could differ materially from its current expectations. Factors that could contribute to such differences include risks and uncertainties associated with the Company's ability to effectively manage schedule changes or cancellation of customer orders, control costs and expenses, and obtain additional financing, if needed. Reference is also made to other factors described in the Company's periodic reports filed with the SEC, including the Company's most current Annual Report on Form 10-KSB and subsequent Quarterly Reports on Form 10-QSB. These forward-looking statements speak only as of the date of this release. SpaceDev does not intend to update these forward-looking statements. About this company SpaceDev, Inc.